Amrita Krishnan is a sophomore in high school with a passion for art. Her particular interest revolves around scratchboard artwork. Having already earned a distinction as an Active Member of the International Society of Scratchboard Artists (ISSA), her dream is to one day hold the title of “Master Scratchboard Artist” (MSA) the highest level of juried membership in this prestigious institution. Scratchboard comprises a few layers of India ink painted upon a white clayboard. When scratched with a scraper or a scalpel, the ink peels away to reveal the underlying white. 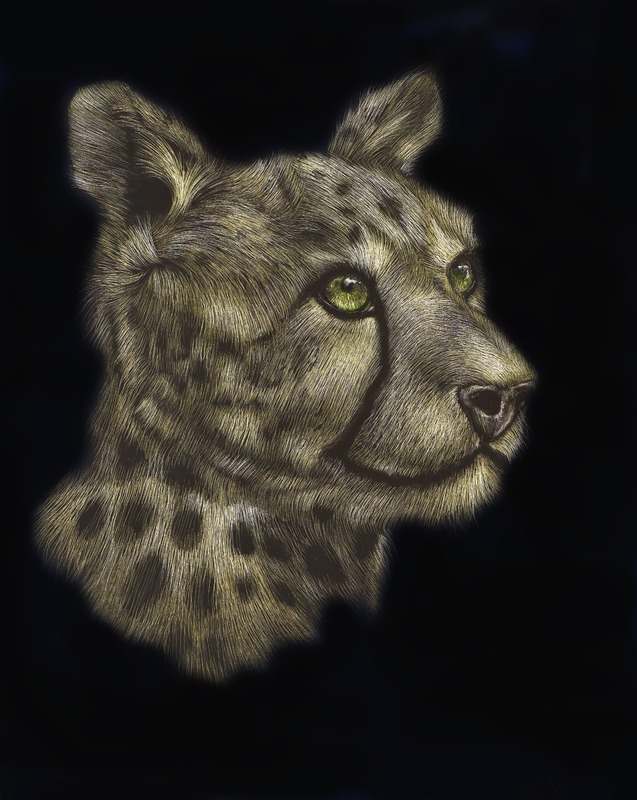 Amrita’s scratchboard subjects usually feature animals, though occasionally she does people as well. She has a real love for wildlife that is her driving force while creating her works of art. Her favorite animals she portrays are those African mammals that roam the savannah, including buffaloes, cheetahs, and zebras. “Ready for the Chase” shows a cheetah contemplating its next meal. This piece is done on an Ampersand Scratchboard and is colored with layers of Ampersand ink. The coloring process is very tricky, and requires the artist to be really patient. Each coat of color must be heavily diluted; therefore several coats must be applied to reveal the true brilliance of hues. Between each application of color, the artist must rescratch the highlights so as not the lose them. Each piece takes about a week or so to complete. Amrita has pursued scratchboard for only two years, but she hopes to run with it for the rest of her life. Some of her works can be viewed on her website: www.amritakrishnan.com. To learn more about our national art contest, visit www.CelebratingArt.com . Johee Shin just completed her junior year at Hebron High School in Carrollton, Texas. While she has focused on art as she’s grown older, her parents allowed her the freedom to experience many different activates like ballet, tap, jazz, swimming, golf, tennis, piano, violin, and flute. She decided out of those activities that art was her future path and has dedicated herself to it whole-heartedly. Johee’s talent has been reflected in our national art contest, as she has been selected as a Top Ten Winner in three different contests, and published a total of five times. Below are her Top Ten pieces: Primal Desires, Inner Sanctum, and Tethered (shown at the bottom). My art teachers often told my mom that I had a lot of potential when I started going to an art studio in 8th grade. It was a new place where I could work on my own and be inspired by fellow artists around me. By producing work and getting to improve my skills I was allowed to explore various techniques and build on my talents. I entered the contest Celebrating Art in the 9th grade where I managed to receive three Top 10 awards. They are all still-lives and landscapes since I was still learning the foundations of painting during that time period. I have explored different kinds of medium, but oil still seems to be my favorite. I am still learning as an artist and have plenty of room for improvement. I also have been experimenting with watercolor recently to find my own unique style that would differentiate me from other artists. Whenever I am stressed out about school or I just need a break, I turn to painting, as it is therapeutic to me. My current top priority is my AP art portfolio. I have matured a lot through the making of this portfolio as it has given me a chance to try out new styles as I go in-depth in my concentration. I still attend the private studio that I started with in 8th grade as well as my public school art class. I am now starting my college art portfolio and my future plans still revolve around an art career. If I am really meant to be an artist, I will end up as an artist. I plan to use my talents to serve God! Congratulations to Johee again on her incredible successes thus far. To learn more about our national art contest, visit www.celebratingart.com.